HG Logistics News Thank You Veterans! Say “Thank you”. We often see veterans wearing hats or jackets showing that they served. If you see one (or more) of these today, simply saying thank you can brighten someone’s day. Give a donation to a veteran’s organization. Think of donating to the VA, American Legion, AmVets or VFW, the USO, Wounded Warriors Project or Disabled American Veterans. Visit a local VA and spend time listening to veterans there. Sometimes hearing a story really makes us see things in a new way. Bonus points for taking your children along. Buy a meal. If you see a veteran when you are out for lunch, coffee, or dinner, discreetly pay for their meal. Sometimes the most gratifying acts are the ones we do anonymously. Decorate the graves of servicemen or women who have passed away. Remembering to honor those who are gone shows respect and gratitude. Check in with a family member who is a veteran. Maybe it is someone you haven’t heard from in a while, and maybe it is someone right next door, but showing our family members who served that we appreciate their sacrifice is touching and builds strong bonds. Volunteer. Sign up today to volunteer for one of many organizations that help veterans. Use your carpentry skills to help modify homes for wounded vets, deliver meals, enlarge family photos for those staying in the VA so they are easier to see, the possibilities are endless. Ask your office to focus on hiring and recruiting practices that value veterans, or suggest a veteran you know who may be in need of work for a position at your employer. Put together and send a care package to those currently deployed. Most communities have nearby organizations who will take your items or packages and help to be sure they are shipped properly. Sign up to adopt a military family for the holidays. Send a letter. Much like a care package, your words of encouragement (and those from your children as well!) are very meaningful to those who have or are currently serving. Again, organizations abound that can help with getting these to the right places. Educate your children. Make sure they understand the sacrifices of veterans and their families and encourage them to learn about our military personnel and why Veteran’s Day is important. Do chores. If you know of a veteran in your neighborhood, stop by and ask if they have anything that you can help them out with. No chores? Offer to make them a meal! Invite a veteran to Thanksgiving dinner with your family. Many veterans are older and alone. Being with a family can bring happiness and warmth to the heart of a veteran. Support a veteran-owned business. Veterans are often business owners in nearly any imaginable field, say thank you by supporting their endeavors. Give up your seat. If you are flying first class and see a veteran on board, offer to trade them seats as a thank you. Attend a Veterans Day event. Take your family or friends to show support. Remember veterans year-round. While it is nice to take a day to say thank you, it is even better to make it a habit. Thank a veteran (and his or her family) EVERY time you can. Make your donations, visits, care packages, etc. on a regular basis. Monthly or weekly activities will integrate into your routine and seem effortless but will remain appreciated. 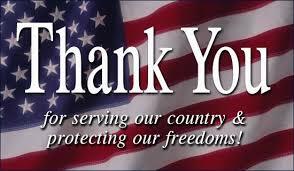 Again, HG Logistics thanks and honors our veterans every day, and especially today, on Veterans Day. We are proud to live in this great, free nation and thank you for defending our rights and liberties. Contact us for more information about our company’s services and opportunities. Veterans are ALWAYS welcome to apply!